Another beautiful pond view from my library window! Yesterday I sat in my warm, cozy library and admired our new fig tree. I wondered if it might be an evergreen variety because it was so green and full of life. Not a leaf had turned yellow nor orange (not even brown) in our autumn air. Last night we experienced our first serious frost! As we speak, as I write, the leaves are falling off right before my eyes! Those large healthy green leaves now lay wilted in a pile on the cold ground. shriveled leaves trying to hang on for my sake. Is there a spiritual lesson here? I'll let you tell me. Happy Thanksgiving Day to everyone! While I was reading in the library recently, a brown swish passed by the picture window and caught my eye. Another movement quickly followed. A rumbling thunder pounded the ground as two half-grown fawns raced from back yard to front, with hooves airborne. Again and again they raced around the red twig bush, with dried horse chestnut leaves flying off the ground, and returned to the back yard. This dogwood bush is showing more pinkish-red color as the cool nights announce autumn is here to stay, at least for three short months. One deer returned to scale the knoll by the pump house. He approached it as if he was on a pogo stick—all four legs stiff as he bounced and flexed his young muscles. They had their morning fun and returned to the back yard to rest under the grape arbor and chewed their cud. They feast on the low-hanging grapes and the tender new leaves. We are harassed by patches of clover from the result of old orchard grass in our lawn. The deer love to nibble on the clover flowers and any other beautiful, tender blossoms within their reach. I'm thankful they ignore, at least for this year, my colorful dahlias. One year they will devour my favorites and the next year they change their diet to another treasure of mine. This year they loved my chocolate plants for the first time. I can't blame them for that treat. Chocolate is addicting. This herd of wild animals spends a lot of time in our yard. My husband's official deer food from the pet store, the salt lick block and the watering trough under the cedar tree makes them feel welcome until deer season when they wisely disappear from the neighborhood. steep hills (I thought of Nancy D.
Can you guess what I did today for the first and last time? Is this your first visit to my blog? Welcome! Emissary by Thomas Locke is high adventure in a strange world where evil wars against people of the realm. Unknown power sources are everywhere. The author writes with great description and has talent to describe the abnormal as common. A very complex story of mystery and intrigue. Without a glossary of terms in the book, the reader must stay alert to the many types of beings and creatures in the realm and their histories. The book kept my attention with my mind dwelling on the plot during the day. I normally don't read fantasy, but I'm hooked and look forward to the next book in the series. Rating:**** stars. It's a book a person would enjoy reading the second time to further understand the plot. I looked up from my book at the perfect moment. I gasped as his tail disappeared up the golden cedar tree. I leaned forward in my library chair to see which way he would run. I haven't seen his kind in twenty years. His relatives were plentiful when we had our filbert orchard, but they moved away when we changed the landscape. Three deer resting on the grassy knoll in the sunshine didn't flinch at his presence, but continued to chew their cud and twitch their ears. They didn't appear to share my morning excitement. I have learned while reading in the library to keep one eye on nature. I hope and pray this visitor will make its home here with the brown tree squirrels. To me there is nothing more beautiful than a gray squirrel and his long fluffy tail floating behind him as he scampers from tree to tree. A silver Eurasian collared dove flew by my window as I finished writing about this morning's adventure. Now back to my inspirational book by Max Lucado. Happy Birthday to: Sue, Jessica, Mo, Shirley, Joann, Jeannine and myself! Happy Anniversary to Dianne & Gary and Loren & Nancy ! This is the view from my library window this morning. Of all I see today, the most impressive is God's azure sky, so clear, so cloud-free. It seems to go on forever. Don't you love the view from a 747? Now you know why I love the view from my library window. Even in the shade, the air is extremely warm today, actually hot! My lawn chair faces the koi pond while I rest and scrutinize my latest project: wooded steps up an incline, or down, depending on which way I'm going. For several years I put up with the effort of making my way along this path, but finally when I had nothing else to do (believe that? ), I changed the landscape to give the path a more designed appearance. Hopefully I'll get more leg muscles using the steps too. With a glass of ice water in one hand and a pen and tablet in the other, I'm watching the flag, which hangs over the pond, dance in the breeze. It's not flapping loudly like in a strong wind, but gracefully rising and falling as the soft wind blows through my garden. The old saying 'take time to smell the roses' is relaxing advice no matter what your age or occupation. 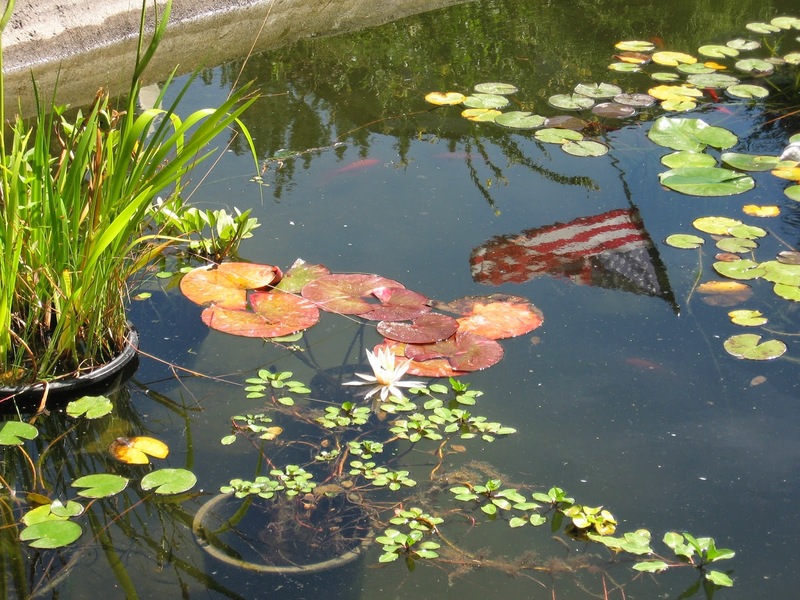 The scent of my roses doesn't reach the pond area, but watching the flag flutter and waltz has almost the same results. Seek out your private place of comfort today, away from the world's dreadful headlines and focus on your blessings and the beauty of nature—God's summer gift to you. The cooing of Eurasian collared doves in a nearby tree, the waterfall splashing on the rocks six feet below the falls, the flapping of our American flag in the breeze makes a inviting day to rest in the garden shade. I'm sitting by the koi pond with a good book and a writing tablet. The koi are somewhat distracting as they jump and dive, trying their skill at catching flying insects. Craig attends a three-day church conference, so I'm in charge of watering flowers and pulling weeds. I hope the weeds cook and die as the temperature rises. The weatherman will hit his target today for sure. I wonder how he knew this day would be the only time this week the temp would rise above 95 degrees in the valley. I just moved the lawn sprinkler. That's one great way to cool off! Guess how many times the jumping koi woke me up. Three times! They sounded like someone fell in the pond. I could sit in the air-conditioned man cave, but I chose to sit here in the shade and write to you. Thanks to the Internet, I avoid the task of writing 108 separate letters. And envelopes, too! We live on our land, pay the taxes, and manage the garden, but I thank God everyday for His gift of life and strength to maintain this property, our temporary dwelling place. I'm reminded of the Biblical words concerning Abraham: He looked for a city which has foundations whose builder and maker is God. The author Corbin was expecting the holy city to appear in his lifetime. Are you, as well? Happy 60th Birthday, Barb - sorry, I just had to tell-it's such a nice round number. But I'm way, way ahead of you! “O Lord, our Lord, your majestic name fills the earth! I enjoy a new view in my world. My husband trimmed a huge, fifty-year-old cherry tree in our backyard. With the tree dramatically lowered, I now see blue-gray mountains covered with evergreen trees to the south. We planted so many trees on our two-acre property that we must look up to see into the distance. Looking up is good. As a little girl, I laid on my back on the front lawn, watched the clouds move across the sky, and looked for Jesus to appear as He promised. 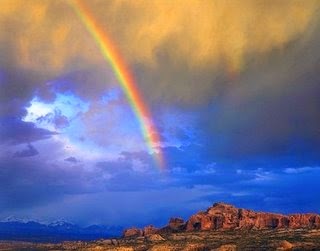 Now when I discover a beautiful cloud formation or an amazing rainbow, I still anticipate that glorious day. The view from a 747 takes your breath away. One year, I enjoyed two worlds as we jetted to California, one view below the dark, stormy clouds and another above white, fluffy cotton balls. That inspiring scene at forty-one thousand feet elevation went on forever, or so it appeared. Bill Anders, Jim Lovell and Frank Borman on the Apollo 8 mission to the moon in 1968 read the Scriptures in Genesis, chapter one, describing the events of creation. I wonder how Christian astronauts on their way to the moon contained their excitement as they saw what God created from their unusual vantage point. I will never enjoy that particular view experienced as an astronaut, but the Lord has blessed us with many beautiful scenes, this side of the moon, of His magnificent earthly creation. Our imagined views during eternity evoke another possible topic and another time.